Today is the PTI Blog Hop day, where the theme is snow!! I had this beautiful piece of patterned paper with snowflakes and thought the PTI one liner die would be perfect with it. I cut the 'Peace' die out of some silver metallic paper and added some silver snowflakes cut from a ribbon strip. Easy-peasy - and oh so elegant! Thanks for stopping here along your hop!! There have been some great snow cards out there in PTI land!! Saturday was another fun scramble over at the Hero Arts Flickr group! Theresa was our host this time and she gave us a fun theme of 'snow'! We had 90 minutes to create our card, photograph it and get it posted to the Flickr site. It is always so fun to rush around trying to come up with an idea and bring it to a finished product in that amount of time! And knowing there are others around the world doing the exact same thing makes it even more fun! So here is what I came up with for my 'Snow' theme card. I had this great patterned paper with swirls and sparkly snowflakes so I used that as my background to these cute little snowmen from Hero Arts. I stamped them and colored in their hats and scarves. Then I punched them out and inked the edges of the circles with distress ink and popped them up. The punny sentiment is Hero Arts and goes perfectly with these little cuties! They make me smile every time I see them!! Have you ever joined a scramble with the Hero Arts Flickr group? You should give it a try - they are so much fun and the members are so friendly and nice, you are sure to make a new friend or two! They are usually held every two weeks. Click HERE to find the schedule. 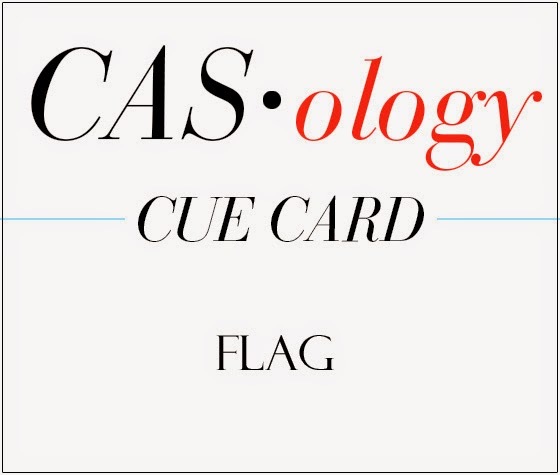 I am sharing a card I made for the current CASology challenge where the cue card is FLAG! I wasn't quite sure what to do with this word at first....I thought all week about boats with flags on top of the sails, the American Flag, and flag poles, but couldn't come up with anything that I thought would work! Then when I was digging through my supplies, I found this banner punch and stamp set and thought I could do something with them. Then I remembered the cute little HO HO HO sentiment from a Hero Arts set, and it all came together!! The little Santa hat is from the new Mama Elephant Arctic Penguins set and it fit perfectly on top of my little flags! I am really happy with the way this turned out - especially after thinking about flags all week! I am sharing a card I made using a technique I saw Julie Ebersole use on a card in her Hello Monday series over at Ellen Hutson. This is such a great technique that gives a 3D effect to your card. It is similar to shadow stamping, but you heat emboss the second image instead of just stamping it. It works great with snow! I used the HA starry sky BG stamp to create my 'snow' and paired it with a great silhouette stamp from SU. The sentiment is Hero Arts as well, embossed onto some grey cardstock. I really like the way this turned out. What do you think? I finally got a chance to play with the Mama Elephant Artic Penguins stamp set I picked up last week at Impress! I just love this set, the penguins are so darn cute. Another purchase while at Impress was this great Avery Elle Circle Tag Die. Combine the two together and it's almost cuteness overload!! I love the little 'extras' that you get with this stamp set. The present is adorable and there is a coffee cup and some cute hats for the penguins to wear. I created the sky by blending some distress inks in salty ocean and broken china, then white embossed the snowflakes from the set. I added a little color to the penguin and thought the red in the present and the ribbon were a nice pop of color. The sentiment is from a Hero Arts Christmas sentiment set. Thanks for stopping by! I'm sure you will see more of this cute set in the near future!! Sharing a card I made for a friend who needs a little encouragement right now. I received this great Lawn Fawn Party Banners Die set from my HA flickr friend Cat when I was the winner of her scramble a while back. Thanks Cat! I stamped the cute tree and critter from an SU set I got from my Mom. Thanks Mom! A little polka dot paper for some fun and a twine bow to finish it off. A pretty easy card that I hope will lift her spirits. 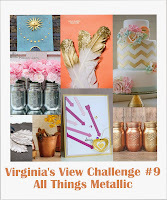 I am submitting another card to Virginia' View Challenge where the theme is metallic. I used the same Memory Box ornaments die I used on this card. I die cut it twice, once from Cherry Cobbler and once from gold metallic paper. Then I embossed the gold ornaments with a dot embossing folder to give them some dimension. I added them back into the red outline and added a little gold washi tape that I picked up at Impress last weekend. I am adding this card to my growing pile I will be sending to the Caring Hearts Card Drive. Edited to Add: I just found out about Emily Leiphart's SquirrelFest and knew I wanted to play along. This cute squirrel card fits perfectly with her theme! 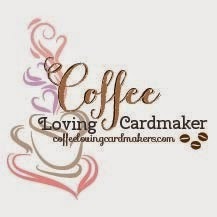 I am sharing another card I made during the Online Card Classes. This technique results in a fun window with a shape cut from it. You need a die cut that has a matching stamp and partially die cut the window shape. I blended some distress ink in some fun fall colors in the background to help my cute little PTI squirrel stand out. I think I need to go back and add the little acorn die cut to the squirrels hands! I am super excited to be joining the CASology Team as the guest designer this week! How cool is that?? The Cue Card this week is such a fun one! FESTIVE - it brings to mind so many things. I made a cute little tag with a fun party scene. I cut my tag from a MFT tag die and added some Heidi Swapp color spray splatter. When that was dry, I stamped the champagne classes and the ornaments in Gold Delicata ink. (love that ink, by the way) I think the cute little confetti squiggle is what really pulls it all together! It is from a Mama Elephant balloon set. I added some glossy accents in the glasses to look like they were full. A little gold ribbon and a fun sentiment finish it off. By using all one color ink, it keeps the scene CAS. 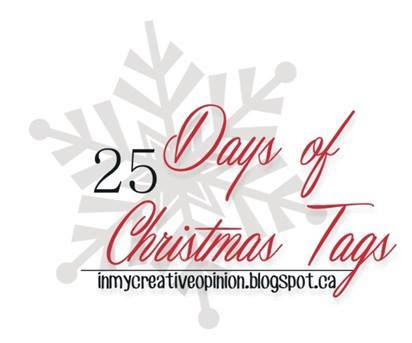 I also got lucky in that my week as guest designer happens to fall on Tracey's 25 Days of Christmas Tags with the CASology team. So of course I made a tag to play along with all the fun over on her blog. 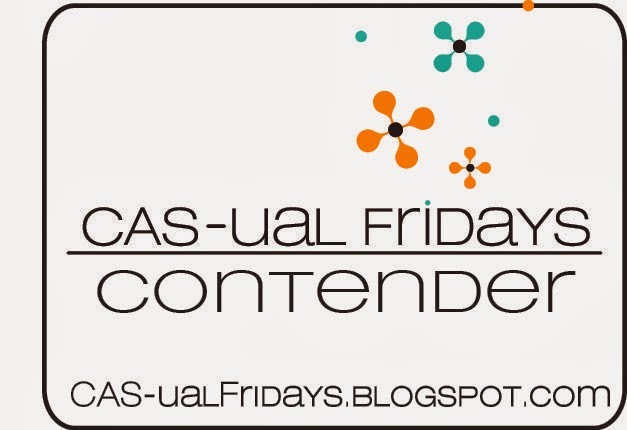 If you haven't checked out her blog yet, be sure to head HERE and join in the excitement. 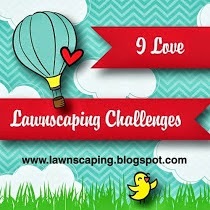 The inspiration is amazing and there are prizes from some great companies. Tracey has kindly offered a chance to win for commenting here on my blog too! Leave a comment by the 27th, and I will randomly choose one name and forward that onto Tracey. Thanks to the CASology team for having me this week! 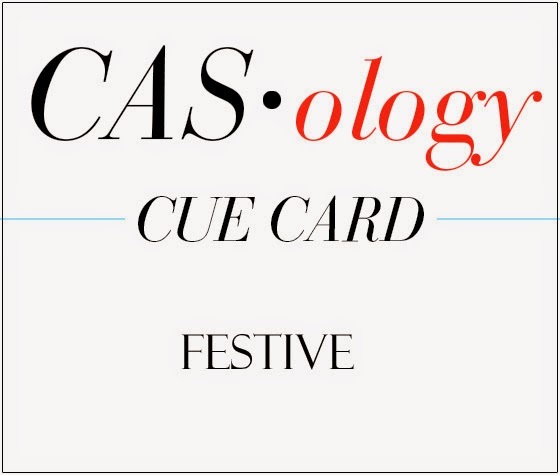 I can't wait to see what the rest of the team created for the FESTIVE cue card. You can get Festive too, just go HERE for all the details. 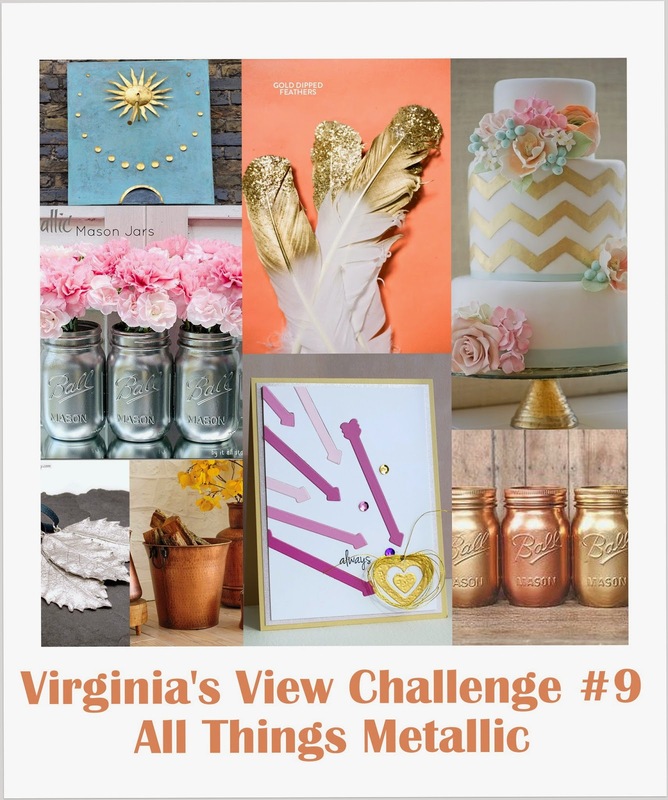 Edited to add: I am also submitting this to Virginia's View Challenge where the theme is Metallic! How was your weekend? Mine was great - I got to spend Saturday with some of my crafty friends, Amy and Tonya taking a Julie Ebersole class at Impress! Yes - THE Julie Ebersole! And as an added bonus, I had Sandy Allnock of Operation Write Home sitting next to me in class! I don't think it can get much better than that! We had a great time making cards, talking and laughing. Love the silver washi tape on this card! Trying to think if any of my word dies are bold enough to recreate this card at home. How genius is this to create a snowbank for your snowman? The black cardstock behind the vellum is cut shorter than the vellum to create that illusion! This little polar bear is just so cute peeking out of the circle punch! This is only 3 of the 12 cards we made - hopefully I will get around to posting some of the others this week. Thanks Julie for such a great day! Day 5 of Online Card Classes was all about Tags! There were a lot of fun examples, and I chose to make a shaker tag. Yana showed us how to use the same idea and make a simple, medium and more advanced tag just by adding a few extra steps. I started by punching the snowflake from a tag, and lining it with a piece of acetate. I added some patterned paper to the second tag and filled it with sequins. Using foam tape, I put the two tags together to create the shaker. It looked a little plain, so I stamped a few snowflakes in a soft blue color. I think they add some interest but don't distract from the main shaker snowflake. The sentiment is PTI stamped in Versamark Black Onyx ink. A little red and gold twine added to the top and that was that! So fun to make a shaker tag. I think it would be great on a bottle of wine as a gift to our neighbors this Christmas! 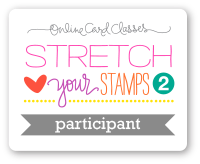 I am really enjoying the Online Card Classes Holiday Workshop 2014! Are you taking it too? You can sign up any time and you get lifetime access to the videos and PDF's of each card. Day 4 of class was about one layer cards. Definitely postal friendly which is good when you are mailing out a bunch of cards for the Holidays! I liked Julie Ebersole's card where she used a mask and created a fun 'snowy' dimension around the image. I tried to duplicate that with the word JOY instead of a solid image like she had. When I pulled off the mask, there just wasn't enough definition around the letters that you could tell what it said. But I still liked the 'snowy' effect, so I salvaged the card by die cutting the word from some shiny red paper and popping it up with some foam tape. Not exactly the 'masking' look that she had, but I like it nonetheless. I will have to try her technique with a different die cut to see if I can get that cool result! Just a quick card to share today. I made this for the current Lawnscaping Challenge where the theme is pumpkins and fall. I used the new Sweater Weather set (love that tree and those cute little leaves!) and the Thankful for you set to create this little scene. Lawn Fawn stamps just make you smile don't they? Thanks for stopping in and sharing part of your day with me! I'm sure you have heard about this card drive that is going on. Jennifer McGuire and Vera Yates have teamed up again this year to collect homemade cards to send to the elderly in nursing homes. A few weeks ago, I helped my daughter's Girl Scout troop make cards for the Caring Hearts Card Drive. I think this is such a great idea; it fits perfectly with the Girl Scouts and helps the girls with some service projects. I made three different cards as a guide and for inspiration. Then I provided the supplies for each of the 8 girls in her troop to make one of each card. They had a great time using the stamps, inks and punches. It's funny how some copied my cards exactly, and others used their own imagination to make their card unique and different! It was super fun and I think all the girls enjoyed it too! The fact that the cards are going to a good cause is just the icing on the cake! Today's lessons over at Online Card Classes was all about watercoloring! I really like this fun technique, but don't find myself using it very often. So it was great to pull out the watercolor paper and distress inks for my card today. All of the examples in class were amazing, but Kristina's card was by far the easiest to replicate. I first stamped the sentiment from a HA Christmas sentiment set and white embossed it. Then I added the little images around the edge and embossed them as well. Most of them are from the SU set jolly bingo bits. ﻿After that, I added Peacock Feathers distress ink over the sentiment with a water brush, and layered in some Faded Jeans and finally around the outer edge, I added some Memento Nautical Blue ink. The final touch was to add some stickles. The red stickles seemed a bit too dark for my blue card, so I choose fruit punch stickles instead. I was happy with the way it turned out, and think I will try it with some different colors of ink. It was another fun day over at Online Card Classes yesterday! The lessons were all about interactive cards. There were shaker cards, sliding cards, cards with front doors that opened! I debated about which card to make for my 'homework' and then remembered that my crafty friend Lisa Lara had given us these super cute snowman pieces from A Jillian Vance to make a shaker card with at one of our last crafty get-togethers at Amy's house. Everyone else used theirs already, but mine was still sitting on my desk. This was the perfect opportunity to build that cute little snowman and fill his belly with some fun sparkly stars! I cut some snow banks, added glitter to the top of them and created some glitter snowflakes falling from the sky. The sentiment is from PTI Rustic Wreath set. This was so much fun to make! Thanks Lisa for the cute Sam E. Snowman die cut pieces!! Can't wait for the rest of class to see what else they have in store for us. I know it will be great!! I'm sharing a card I made for the Hero Arts Challenge and for Virginia's View Challenge. Both challenges are about metallics-so it was easy to have one card for both! I die cut the Memory Box ornaments from some silver paper and added them to SU Cherry Cobbler cardstock. The white embossed sentiment is from HA. I really like the way this turned out, and it is an easy card to replicate. Have you started your Holiday cards yet?? YEAH!! Today is the first day of Online Card Classes Holiday Card Workshop! These online classes are so fun. I learn so much from the great instructors, and I enjoy meeting so many talented crafters. Today there was so much to choose from....and it's only day one! I liked all the examples they showed in class, but I decided to CASE Kristina's card. Surprisingly I had similar products to what she used, so I was able to replicate her card easily. I'm still trying to get the hang of using embossing paste. Some of my dots are very thick and others are pretty see-through!! But I guess no two snowflakes are alike in real life, so why would it be any different on my card?? 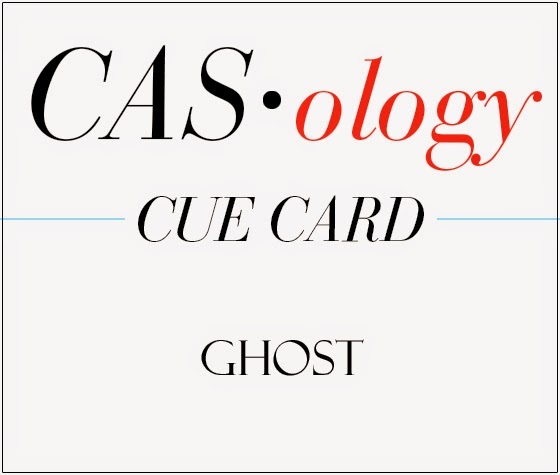 I am adding a card to the current CASology challenge, where the cue card is GHOST. I found these adorable Doodlebug Ghouls and Goodies Doodlepops and 6X6 paper pad and just fell in love with them. I used the cute ghost sticker on top of a tag made with the My Favorite Things stitched tags die. I white embossed the sentiment (but I don't think anyone would be scared by this little cutie!!) and added a little black and white twine tied in a bow. Easy-peasy and oh so cute! I used the ideas off the basic grey blog to make the Monster, Mummy, Spider and Frankenstein box. I really wanted five boxes, not just four, so I came up the Witch box and put pickles (complete with bumpy warts) inside for the Witches Nose!! Here is a picture of my two little ghosts and goblins - or in this case my ninja and mummy!